Acer palmatum dissectum ‘Lion Heart’ is a lace leaf weeping Japanese maple that comes out in the spring with brilliant red color. I have a few of these, still quite small in my nursery and I was amazed at the fall color as I took these pictures. I have these small plants growing in full sun and they held up really well which speaks volumes for a plant with the delicately cut lace leafs shown on this amazing little Japanese maple. This is for sure a plant that I will keep my eye on. Florie, before spring I am going to publish a list of people all over the country with Backyard Nurseries. 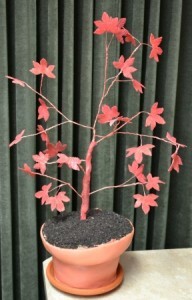 Many of them do have a variety of different Japanese Maples at really good prices. Stay tuned, that list will be out soon.